It was a great success, and many people have asked for a repeat so there will be another performance in the rebuilt Institute Hall on Thursday 8th July at 8pm. Tickets price £1 will be sold in aid of the St Jude’s Appeal fund and the Institute Rebuilding fund. They are obtainable from the HGS institute or at the door on the night. On our informative walk, we saw the Corn Exchange, several historic inns, the Custom House We went into Clifton House which has a handsome early 18th century front and portico with twisted columns, thought to be the work of Lynn's creative architect of the period, Henry Bell The house contains panelling and plasterwork from the early and mid-18th century In the entrance hall there are two rooms with early 14th century tiled floors exposed to view and the crypt has beautiful late 14th century brick-vaulted undercroft with tracers of a yet earlier stone house of about 1200.Our last call was at the 15th century Hall of the Trinity •Guild, where the undercroft has been refurnished as the Regalia Rooms, and houses the civic regalia, plate and charters of Lynn, including the unique 14th century cup of richly enameled silver gift,' known as the King John Cup. Once we were seated in Thoresby College, with a grand view of the Ouse, to be refreshed by an excellent tea and spread provided by the members of the Preservation Society, it began to pour down heavily, The College was built around 1511 by Thomas Thoresby as a college for thirteen Priests of the Trinity Guild After the usual changes of ownership - the place has been a private home, a school, a warehouse for a mineral water factory, - the Trust has restored it as flatlets for retired people, as well as a Youth Hostel. The west wing - once the priests' dining room (in which we had our tea) - is also used for meetings The work of the Preservation Trust was explained to use, and it is a record of rescue & preservation of many buildings which are now being used and enjoyed when they might have become derelict and have been pulled down. King's Lynn had its period of prosperity when the Ouse was an important waterway and the town traded with Europe. Industrialisation passes it by and as a result, it contains many buildings of great interest and beauty which might well otherwise have been destroyed in the name of modernisation and progress. The group would be delighted to have more members, as "one-off' bits of research crop up fairly constantly., e.g. the notes on a field next to East Barnet church in last month's Newsletter anyone who would like to be on the documentary rota for odd jobs, or who would like advance warning of the autumn group meeting, please let Brigid Grafton Green have your name. We got off to an enthusiastic and productive start with quite a lot of progress on Handley Page at Cricklewood and Grahame-White at Hendon, but someone to research de Havilland at Stag Lane proved elusive Then the Gremlins struck and the project was nearly grounded As, an, example, arranged a day off to Investigate the RAF Museum's archives but, as t was leaving hothe for the Museum, the 'phone rang and the office requested my presence (the firm landed a fat contract which was nice but it didn't help my research) Now, following some desultory activity, there are signs of a renaissance. December 11th The Civilisation of Ancient Egypt (Barry Kemp) One-day courses begin a 10.30a m. and end about 6 30p m.
In Newsletter No 121 - March 1981 - TESSA SMITH described one of the eight objects which form the Moxom Collection of Roman Pottery from Brockley Hill, now kept at Church Farm House Museum It was, she had discovered, a spacer used to separate tiles from the wall of a hypocaust since then, Tessa has been investigating another Moxom oddity - this time a pottery flagon of unusual shape (for drawings of it, by DAVE KING, see final page) This is the story of her research. Then you see that it is cracked down the length of one side, which means that it could have been slab-built the crack occurs at the weakest point, where two edges had been welded together during construction. When I peered inside the flagon by torchlight however, I discovered what looked like ring-marks on the inside walls you can imagine my excitement, because that indicated wheel-thrown construction and not slab-building at all. How had this thrown pot, initially curved, taken on a final square form? My first thought was that the flagon, while drying, could have toppled over on the bench and, under pressure of its own weight, one side could have taken on the flatness of the bench top the Roman potter noticing this, could have then flattened the other three sides on the bench to match, and thus invented a new shape of flagon Very romantic! One modern potter showed me a pot he had made recently in just this manner, complete with thrown neck and rim, showing what a simple and satisfactory method of manufacture it was. A third method was considered - namely, that a thick cylindrical shape could have been thrown, then the sides pared down with a knife to give a square form this would also give 'knife marks' . No hand-made coiled pots of Roman origin have been found at Brockley Hill this Method would have been too time-consuming for the Romans, and was ruled out. Opinion was that the flagon was definitely a wheel-thrown form, later squared off . if the potter had not copied his idea from some other ceramic, what about glass? Was it just a coincidence that the flagon happened to look so much like the new square bottles which were all the rage in the Roman provinces just then? wheel. No attempt had been made to copy the underside rings of a Roman glass bottle It seems that it was sufficient for the potter to: attempt a rough clay replica. burial, usually an ordinary domestic pot but sometimes something more elaborate like a glass jar (8) on the other hand the eyewitness report is unsubstantiated and no . orders for flagons from :the Brockley Hill potteries. It might perhaps be helpful here to mention the history of flagon development at Brockley Hill. potters from Gaul in pre-Flavian. times. A wide variety of flagon forms was then produced during the early years of the potteries pinch-mouthed flagons, derived from a metal form (10) two-handled flagons with a squat bulbous body and disc-mouthed flagons. The most popular line of production was ring-necked flagons, usually single handled, with long, flaring necks. These were characterised by a number of moulded rings at the rim, which form the basis of classification. 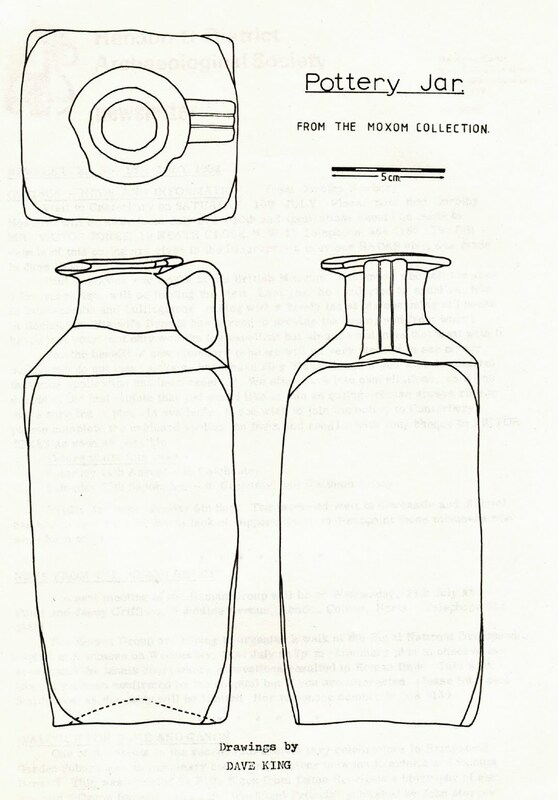 These flagons were strong and imposing, and were supplied to the Roman army, which used a number of flagon types in Claudian days, later rationalizing them to just one or two standard forms In the Flavian period (ad 69-96)Brockley Hill .production settled down to a steady standardisation of output of ring necked flagons (11) In one dig alone at Brockleyy Hill at least 462 ring-necked flagons were represented in the finds, all being long-necked types (12). After studying this unique flagon, I am still left with a number of unanswered questions. Perhaps the most interesting one is, why was it unique? Why, having made the experimental prototype, did the potter reject the idea - and the flagon.? ISINGS, Clara (1957) "Roman Glass from Dated Finds"
MARSDEN, Peter (1380) "Roman London"